I'm sure most everyone has heard of Wahl Home Products due to the great line of products but also their reputation. I have had many Wahl products throughout my life and have never had a complaint. I began running four months ago and experience intermediate pain in my thighs which can stop me in my tracks. 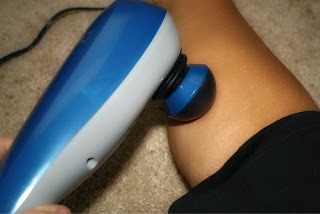 When I had the opportunity to receive a complimentary Wahl Deep-Tissue Percussion Therapeutic Massager, I definitely wanted to see how it would work on my running aches and pains. I instantly fell in love with the four interchangeable attachments and felt the immediate comfort where I hurt the most. I have used the product on my calves, the upper arms, my thighs and my back and it feels wonderful. It's elongated for further reach with a great handle area for all sizes of hands. It's ideal to sit and relax while getting massaged almost effortless. The variation in the speed allows you to get the right comfort level for the area you want to massage. It's highly diverse and you can use it on many areas and you don't have to have aches and pains to enjoy the comfort from the massaging effect. I definitely recommend the Wahl Deep-Tissue Percussion Therapeutic Massager for anyone but since Mother's Day is coming up, this would be a great gift too! I know that I can now run with less pain and I love that! Wahl Home Products has many other products to fit within your lifestyle from hair clippers to men's grooming to women's hair removal to even home pets. The Deep-Tissue Percussion Therapeutic Massager retails at $59.99 (or less if you catch it on sale). It's perfect for anyone! Stay up to date with Wahl on Facebook. *Disclosure: No compensation was received for this post. The Wahl Deep-Tissue Massager was provided for the purposes of this review. Information was provided by Wahl, through MamaBzz about the product and giveaway. All opinions expressed are my own or that of my family.